A Little More Fat with that Pork Chop? 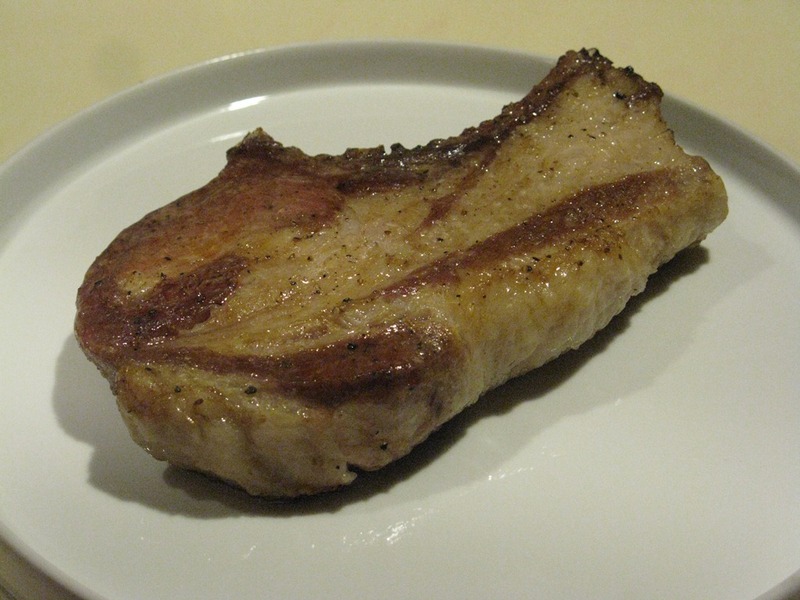 To celebrate the new Dietary Guidelines for Americans [PDF] issued by the U.S. Department of Agriculture yesterday, we cooked the fattiest pork chops we could find. Actually, they were just barely streaked with meat. I found them at the Dupont Circle farmers market on Sunday at the Ecofriendly tent. That’s the Virginia outfit run by Bev Eggleston, who you might recognize as the purveyor celebrated by Michael Pollan in Omnivore’s Dilemma. Bev at one time was working with renegade farmer Joel Salatin and is a primary supplier to restaurants here on the East Coast focused on local, sustainable meats. I usually check out the Ecofriendly offerings on Sunday because the meat is superb and we prize their thick pork chops above all others (although the Niman Ranch pork at Whole Foods comes in a close second). Ecofriendly doesn’t always have the chops available at the farmers market. On this particular occasion, I noticed these super-fatty chops: I’d never seen anything like them before and I was anxious to try them. Our daughter loves fat ever more than we do. I seasoned the chops very simply with salt and pepper, then seared them hard in an iron skillet and finished them in a 350-degree oven until the internal temperature started to close in on 140 degrees F.
Needless to say, there were no leftovers. The new dietary guidelines are being hailed by some because they call for Americans to eat less of everything and more fruits and vegetables. But they discourage fat and specifically suggest drinking low-fat milk. My wife and I, who subscribe to whole cream-top milk and heavy cream from our local dairy, wondered where people are supposed to get their calories. Americans have gotten absolutely wiggy about the food they eat. Nowhere do the guidelines say to stop swilling soda and stop buying potato chips. Instead, they continue to harp on fat, well past the time when we learned that fat is not the problem. We know very well what’s making Americans fat and sick: it’s all the sugar and carbs they’re eating. The guidelines would be much simpler if they just said, Stop eating processed foods entirely, and stick with natural foods like whole milk and fatty pork chops. And by all means, load up on broccoli and salad. People who give up carbs invariably see their risk for heart disease and other health problems decine. We are also convinced that livestock–hence, meat–is a vital component of sustainable agriculture. Just read the lovely piece on the subject posted at the Ethicurean blog. Don’t listen to the federal government. They’re more interested in propping up their industrial agriculture pals. Put your worries away and have a sustainably-raised pork chop. We too had our local pork last night, paired with applesauce canned in the Fall. Yummy. I’ve also noticed that the pork chops from Copper Penny Farm in Maryland have a lot of juicy dark meat that I’d never seen on store bought pork. Cut thick from the butcher; they’re fabulous. Thanks for the pointer to Meat.